The moon on 2/7/15 at 7:30 a.m.
Boston - Where's the pathway on 2/15/15 why bother? 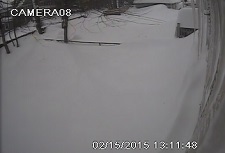 Winter storms continue for New Englanders . I wonder if this weather is any indication of what is coming in the future. 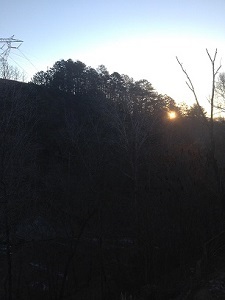 On Saturday 2/7/15 at 7:30 a.m., the moon was visible in the west with sunrise in the east side of my house. I enjoyed watching both at once as I wondered what/if there'd be any affect to Earth. 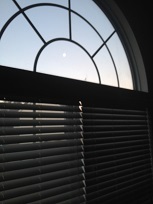 The white spot in first picture through the window is the moon which in its own way shined bright like the sun in second picture. New Englanders were preparing for another snow storm while the Atlanta area enjoyed a beautiful day on the 7th. Two days later everyone I spoke to in Boston talked about how unprepared the "system" was, no closures. Cars, people and plows on streets moving about on impassible streets. Sister girlfriend head of the MBTA Rapid Transit system refused to accept blame for irregularities and delays with train and bus schedules during the storms. Why should she be blamed when MBTA was 100 years old and broken down when she got the job? During last week the Smiths in Boston, MA shared pictures of the storm after their hard days work removing snow, making pathways and parking spaces before Valentine's day. What a waste of time for the residents of MA when the state of MA called the National Guards for help to remove the snow in cities. 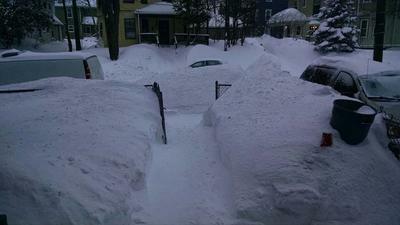 By Thursday, 2/12, everyone knew Massachusetts was getting more snow. I'm still trying to understand why my family didn't except my offer to come south before airports closed. Braving the elements is great, I just prefer braving elements without snow like White water rafting. Wonderful weather in Georgia on Valentine's Day 2015 but not in Massachusetts. The next day I received a flood of emails telling me, "We all wish we were where you are". I know they were wishing cause I was glad I'm in GA looking at their pictures. When I saw the Navy pictures on YouTube a while back, I took them seriously since I know negative thought is energy and affects all, plus man has learned how to control weather. Not knowing when Earth might decide to cleanse herself utilizing the element of water in different forms, I stay prepared with survival materials in car as though I lived in MA and a blizzard might hit any second. Why wait, always be prepared.